Owing to an influx of new members, (great news) Neil and I thought it a good idea to create a 'How to Post New Discussions, etc.,' and also on how to 'Attach a File', or embed the file (image only) inside the actual post instead of just an attachment, and how to then change position of the image within your post. 1) Viewing Threads: When looking at the Forum and you are logged in, you will see all the latest posts come up in 'Thread Form' and any new Discussion or replies to any of them will always come to the top in order of the latest post created. Just click on the one you wish to read. 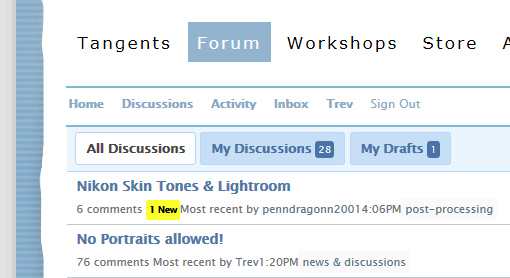 When you close the browser or a TAB on the Forum, then come back to the Forum, you may notice some 'Threads' have a part marked in Yellow, that means there has been a new post since your last visit (you have to be logged in to see this) so straight away you can tell if anyone has posted something new, or created a New Discussion, just like this below. 2) Replying to Posts: Once you read a post/s, at the very bottom you will see a 'Write Comment' section. Just start typing what you want to say. Simple obviously. When you are happy with your response, you just merely click 'Post Comment' at bottom right of the comment section and your post will be then visible for all to read. Some Hints: It's much easier to be as concise as you can in your comments, and give all/any information you have if asking a question, especially if a problem you are having requires a response so any member can try to interpret your query and help accordingly. Also, and this is so it's helpful to members, please do use the 'Enter/Return' key at end of paragraphs/long sentences, to end that paragraph/sentence, then hit it again to put in a line of space ( just like I have done in this post) as this makes it so much easier to read instead of all running on in one large jumbled mess. 3) How to START a New Discussion: On the right side of the Forum, above the links Neil has placed you will see a 'Start a New Discussion'. Click that to open a new section. Click that and you will then get a 'Browse' Button, click that and it will open a window to your computer, navigate to where you have the image you want to upload, choose it and click 'Open'. The image will upload, you will see an 'uploading....' happening and then you will see a small thumbnail of it when it's fully uploaded. 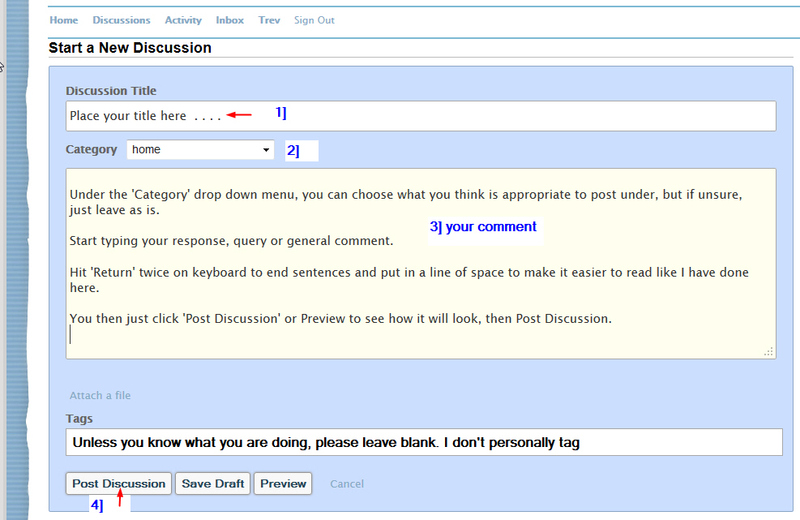 If that's all you want to do, just click 'Post Discussion' if a new discussion, or 'Post Comment' bottom right if replying to a post and you have an image you want displayed. However, if you want to then display the image within the post like you see where I have, there is an Insert Image link beside the uploaded file. Click that and it will put the link the forum needs to see the image at the bottom of your post. The image will NOT be visible at this stage, only the coding, when you finish and post it, only then does the image become visible in the post. No matter where you have your cursor at the time, it will automatically place the image at the bottom. 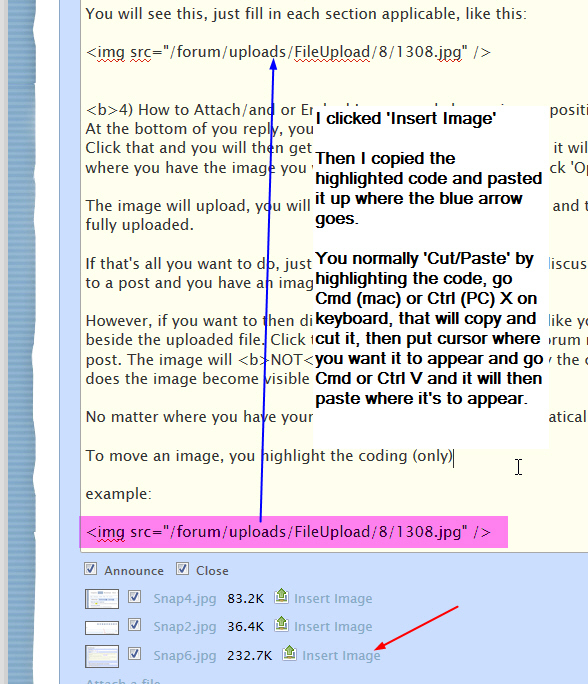 To move an image, you highlight the coding (only) and hit Cmd (Mac) or Ctrl (PC) and the letter 'X', that will copy and cut the line of coding at the same time, then place your cursor where you want the image to be, and hit Cmd/Ctrl V to paste the coding. Once you upload 1 image, you can upload/embed as many images you like, you no longer need to click 'Attach a File', just click on the 'Browse' Button and choose the next one. Image Size: If you want to show a large resolution image, please do not embed it into the post, leave it as an 'Attachment' only, otherwise it takes up a large area of screen when you click on the image to see the full size. Anyone wanting to know what it is, can merely click on the 'Attachment' Link and you will get an option to either 'Open' or 'Download' it. Dimensions for embedded images: Try to resize the image to 900 pixels on the 'long side' and it will fit just fine in the post when embedded. By 'long side' I mean if Portrait make it 900 pixels deep and the proportionate width, if landscape make it 900 pixels wide and the depth proportionate. Google 'image resizing' if in doubt. Edit Re-sizing: I have now attached an action 'Convert to web 200-900px' (below at bottom of post, just click and should automatically download to your download destination you have chosen previously) which will resize your image on the long side automatically, and resolution of 72 ppi for screen. Make sure you copy/or Save As your original file first. 5) Editing your post: You do have a period of time whereby you can 'Edit' your post. I 'think' it may be 24 hours, not sure, you just click on 'Edit', do the edits and then click 'Save Comment'. This image shows how I can edit (unlimited for Neil/I) and you still have the option also if your 'Edit' shows to attach images or insert them. Once you have totally finished reading a thread, just click on the 'Home' or 'Discussion' menu buttons at top and you will go back to a full 'Thread' view, and you will then see your post/comment come to the top. 6) Coding: You may see, like I have done in this post, some stuff in bold or in italics which is html coding. You just need to know what it is. 'b' for bold and 'i' for italics but you need to also use symbols to start and then stop the coding. 7) Forum Etiquette: This has to be the most friendly photographic forum out there, I have seen plenty where it disintegrates into chaos. Please be courteous to fellow members, and remember, a lot of people don't have English as their native language and they post here. So an understanding of limitations needs to be considered, I for one do not know any other language, so I would be totally useless if on any foreign sites apart from English. Anything I may have missed or need adding to later, I will do so. PS: If I have used the word 'Return' key, I meant the 'ENTER' key, a long time back it was known as 'Return' just like an old typewriter you 'returned' it to a new position/line. Sorry, just habit from my background.